Indonesia is the largest archipelago in the world with over 17,000 islands and approximately 249 million people. 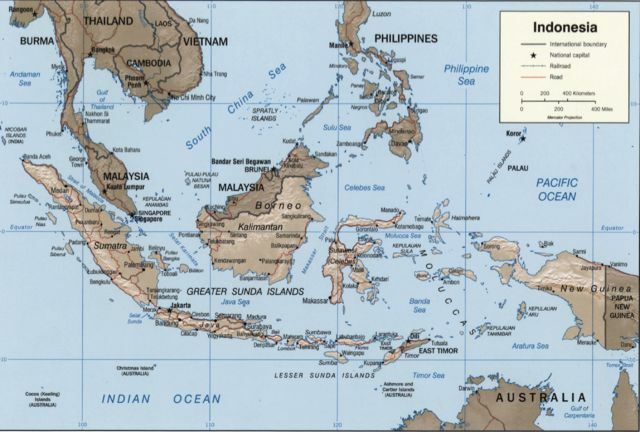 There are five main islands: Java, Sumatra, Borneo (which is shared with Malaysia), Sulawesi, and Papua (which is shared with Papua New Guinea). The capital, Jakarta, is the nation’s largest city and is located on Java (Wikipedia). Jakarta is one of the largest cities in the world. Officially, the population is a little over 10 million, but when you add in the metro area and consider the many homeless people, the actual population is over 20 million. The country is very spread out. If you were to put a map of Indonesia on top of a map of the U.S., the top of Sumatra would be out beyond Washington State, and Papua would be out in the ocean beyond the North Carolina coast! Indonesia’s motto is “Unity in Diversity.” Indonesia is made up of many different people groups, over 770, to be exact! These people groups total 257,405,000, making Indonesia the fourth most populous country in the world. The Javanese and the Sundanese are the largest ethnic groups. Both live on Java and comprise much of the government. Although the national language of Indonesia is Bahasa Indonesia (Indonesian), most ethnic groups have their own language, many of which are very different from Indonesian. In fact, there are a total of 707 living languages in Indonesia. The only country that has more languages than Indonesia is Papua New Guinea. In school and public life, Indonesian is used; however at home the native language of the people group is often spoken. If one is in a village, there is a good chance he will hear a local language instead of Indonesian. Indonesia is now a democratic republic. Recently, many have been encouraged by the political climate of Indonesia. The mayors of Bandung and Surabaya, two of the major cities in Indonesia, have taken a stance against corruption and are changing laws to make the cities cleaner and force civil servants to take their jobs more seriously. There have also been major changes in Jakarta. In 2012, Joko Widodo, better known as Jokowi, became the governor of Jakarta, along with Basuki Purnama (Ahok), as his lieutenant governor. They immediately began making changes in Jakarta, cleaning up the city and ridding it of corruption. Jokowi is a former furniture seller, and Ahok is a Chinese-Indonesian Christian, so the two were a unique pair to be in charge of Jakarta. Jokowi was so well-liked that when the presidential election came about, he received much support, so he ran for president, and won. This forced Ahok into the governor role, and he has continued the changes that Jokowi began in Jakarta. Jokowi is now making changes across the country. Although he had a difficult first year as president, things are beginning to turn around, and great strides are being made, especially in the economy. Today, many Europeans and Australians travel to Indonesia for leisure. Indonesia is a lush, tropical country with palm trees, white sandy beaches, and clear, turquoise water. The country has the most active volcanoes of any in the world. Indonesia has been working hard to improve its tourism. Recently, Indonesia has been putting more emphasis on tourism, and they are focusing on making areas other than Bali attractive to foreigners for vacation. In the midst of the beautiful beaches and palm trees, there is much poverty. Indonesians are among some of the poorest in the world. Furthermore, Indonesia has the largest number of people living near active volcanoes. As a result, the country has experienced many natural catastrophes, including the tsunami that hit Southeast Asia on December 26, 2004. Being one of the hardest hit areas, Banda Aceh has still not recovered from the tsunami. There have been other major natural disasters since then. One of the most significant is the eruption of Mt. Sinabung in North Sumatra. It erupted multiple times from September 2013 to February 2014. It erupted again in October 2014, and for the past year, it has erupted almost continuously (Wikipedia). As a result, over 10,000 people have been evacuated, and fields, homes, and churches are now covered in ash. Another volcano that has caused major problems in Indonesia is Lusi, a mud volcano in East Java. In 2006, a rice paddy broke open and began spewing mud. Since then, 40,000 people were displaced because the mud destroyed an entire village (The New York Times).